This vibrant double-red heart design is the perfect setting for a love poem. Surprise your wife, husband, girlfriend or boyfriend with a poem that you wrote just for them. Personalize it with their name, an optional special occasion date, and a closing message from you and you have just created a unique birthday or anniversary present for him or her. Your Words + This Modern Double-Red Heart Design = A Poetry Gift Keepsake To Treasure. 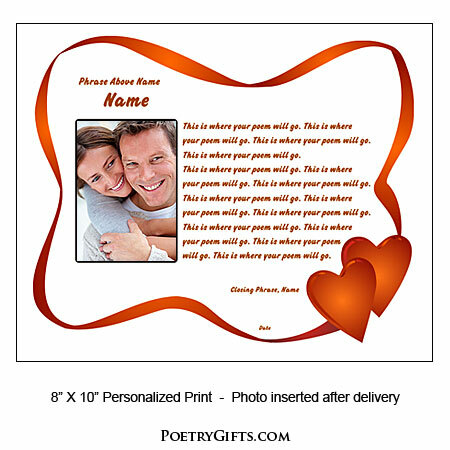 If you are looking for a romantic way to say "I Love You," why not write a poem for your special someone and let us design it for you on quality cardstock suitable for framing. 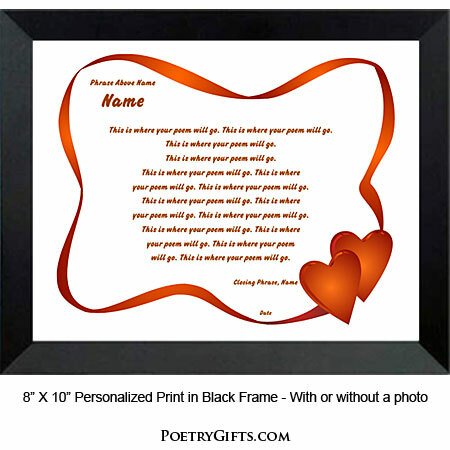 Your personalized poem is so much better than a greeting card that will wind up in a drawer or maybe even in the trash. Your heartfelt words in this vibrant red ribbon and double- heart design will be a very special anniversary or birthday gift for your wife, husband, boyfriend or girlfriend. 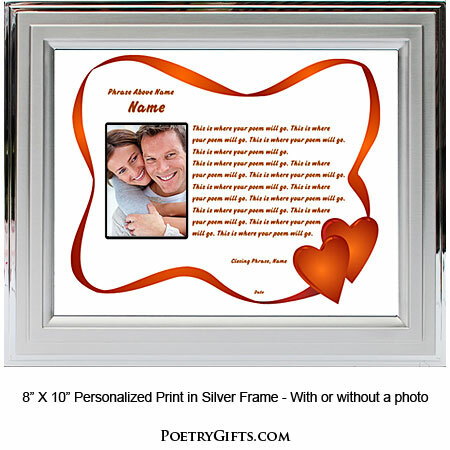 They will be able to display this beautiful Poetry Gift on their desk or dresser and it will serve as a constant reminder of how much you love them. When you add names and dates to your Poetry Gift it will become a treasured keepsake that your loved one can enjoy reading over and over again. In other words "It's a Gift that Keeps on Giving!" Even better, personalize the poem even more by ordering it with an opening for a favorite photo. If you would like to frame a poem, choose from our modern black wooden frame or contemporary silver metallic frame. 3. Closing Phrase and Your Name(s) (as seen after poem) - Examples: All My Love, Josh; Forever Yours, Katie; etc." Please look at the above design in order to determine a suitable poem length. We suggest your poem is no longer than 16 lines with no more than 12 words in each line. There are no set guidelines; this is just a suggestion. If your poem is much longer than the length we are suggesting, the font/type will need to be made smaller to accommodate your entire poem. On the order form, please make sure to type your email address that you check often and phone number in case the designer needs to reach you with any questions. Unless you have permission from the author or poet, please only submit non-copyrighted works. This turned out awesome. Great job by Poetry Gifts. The framed product was shipped securely and it looked incredible. Thanks so much. I'll definitely order from here again. I ordered 4 different prints (Send a Romantic Gift - Your Poem!,Your Poem In Ocean Design, Design A Poem with Red Hearts Border,Inspirational Design for Your Poetry) as part of my proposal plan for my financee. It worked out beautifully as i set up a rose petal trail with each print being a different station ultimately telling the story of our relationship with the last frame asking her to marry me. These gifts are great as they provide a thoughtful and sentimental gift for someone you care about.